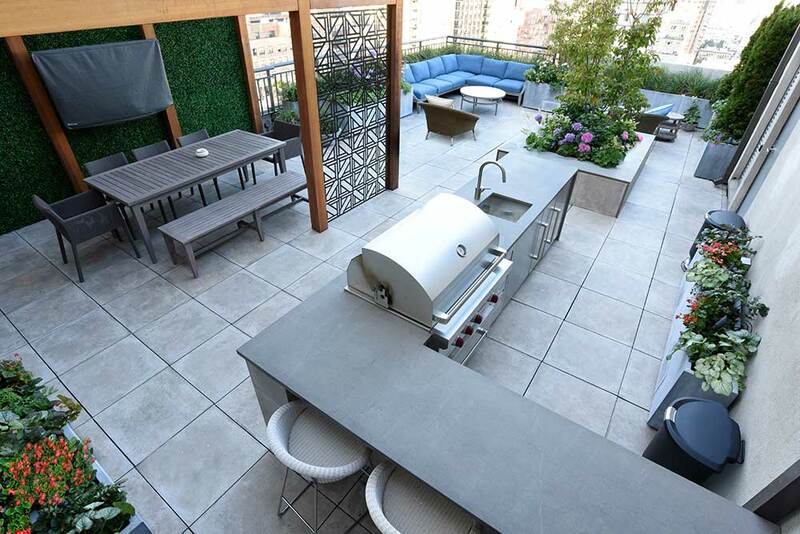 This NYC Manhattan Upper East Side Penthouse Terrace landscape design contains custom planters, (speakers incorporated within them), pergola, outdoor tv, kitchen and furniture. Planted with dogwood trees, knock out rose, hydrangeas and various perennials for an everblooming rooftop terrace. This garden was built in 2015. Twenty-five stories above Manhattan a luxurious duplex opens to a generous terrace garden. Multiple outdoor rooms were created as an extension of the clients indoor space. On the west side of the terrace is the dining room, defined by a handsome wood and aluminum pergola. Guests retire to the living room just beyond it. On the east side of the the space is an L-shaped outdoor kitchen, complete with sink, range, refrigerator, ice maker. The owner enjoys serving drinks and cooking steaks while watching the game on the outdoor TV. The color scheme for garden furniture, plantings, planters, hardscape were highly coordinated. Custom planters with zinc finishes contain most of the plantings and have outdoor speakers incorporated within them! Two Cornus florida (Native dogwoods) and their respective planters help to define the space. 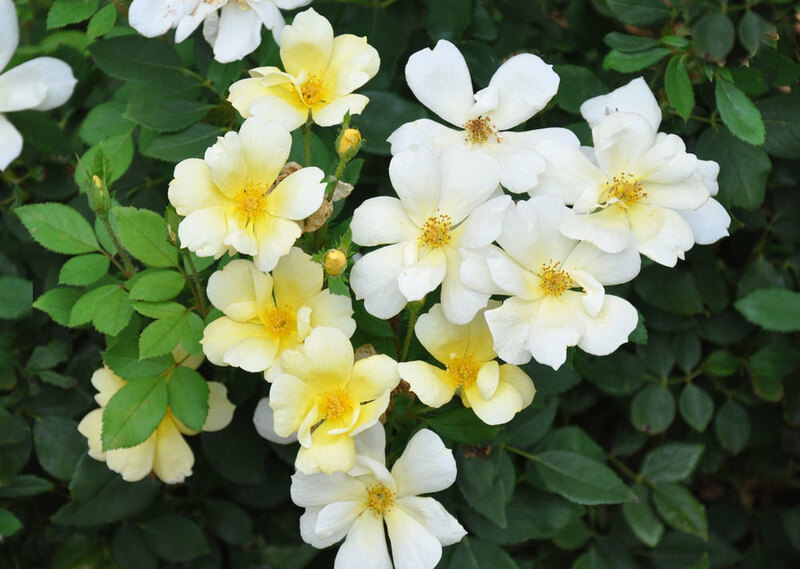 Knock-out roses and hydrangeas highlight the garden plantings. 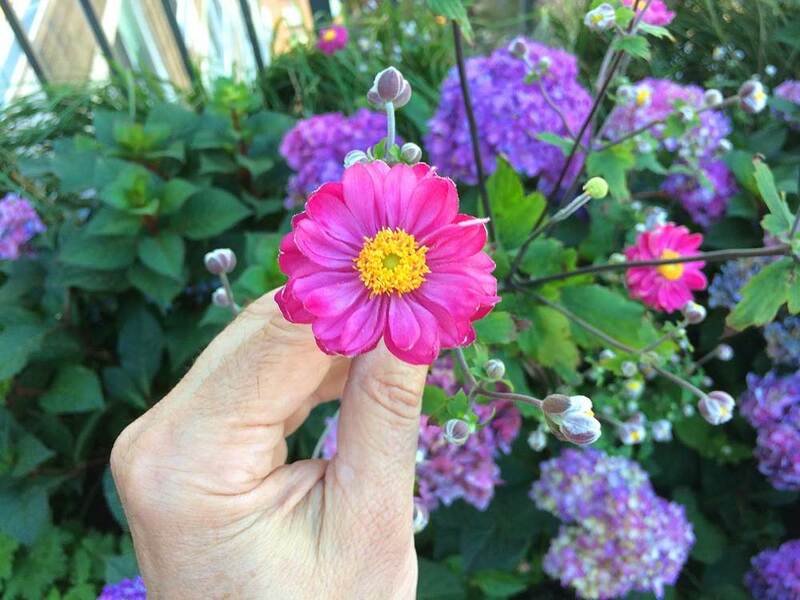 The fall garden spectacular includes three anemone cultivars, asters and woodland sunflowers. Ornamental grasses are expected to mature into a tall perimeter hedge that gently moves with the breeze.